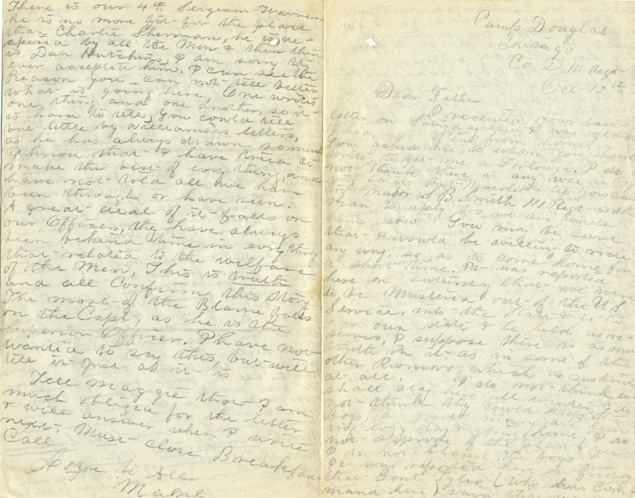 I received your last letter on Saturday last, & was glad to hear so often from home. You asked me, to whom you should write, to get me a Furlough. I do not think there is any use in trying for it. But Nevertheless you can try Major S B Smith 111 Regt is the man to apply to, we are under him now, You may be sure that I would be willing to ride any way, so as to come home for a short time. It was reported here on saturday that we were to be Mustered out of the U S Service, into the State & go to our own state & be held as reserves. I suppose there is as much truth in it, as in some of the other Rumors, which is no truth at all. I do not think we shall stay here all winter. I do no think they could keep the Boys, a great many are leaving every day & going home, I do not approve of the plan & yet I do not blame the boys. It was reported here on friday the Genl Tyler (who has command here) said that we will either be Exchanged within 10 days or we would go to N Y State. I hope one or the other will be so, as it is to [sic] confining here . Monday 6 AM. I got a pass to go down in the City yesterday Afternoon from 1 to 5, so of course could not go to meeting at that hour. We had inspection again yesterday morning from 10 to 12, We were inspected so as to see what clothes we lacked, or what we needed. It seems to be the order of the Day, to have something going on, Sundays, I do not know why it is. Last night some of the Company A & T’s men got up a Row & tore down some of the outside Fence, It don’t seem as if the Boys could be contented, unless in some mischief, I can’t see that they will make any thing by it. It seems to be given up here, by Officers & men, our going to Minesota [sic], They seem to think that we shall stay here until exchanges. I hope this is not so, if we are not to be exchanged this winter that we will go into a little warmer Quarters. It is so perplexing here, we can not tell, one day before another what we are going to do. But then this is a part of the Trade. 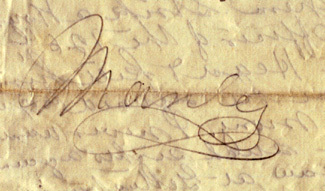 I have received a letter from you, with a $5,00 & a $3,00 Bill in but not the one with $2,00 in. We had a Battle in our Square the other night, between the Right & left wing of the Regt, It was fought with hard Tack, or Crackers. we compelled the Enemy to retreat, but the[y] [railed] again & was compelled to Raise the White Flag, It made a good deal of Fun for us, with out some such thing we would die of Laziness. Williams has been sick for the past few days, I think he has got the Ague*. I have got a very bad cold, just enough to make me feel miserable. We are living a little better now you may be sure with all those good thing’s from home Now. look at our Breakfast this morning. Hard Tack & Coffee & that so poor, the [Kettles] are all grease, not being washed clean. Six boys out of the Company, are detailed every day to wash dishes, & carry Water, We have two boys that have cooked for us, since Crowl left. A great many of our Boys are sick, generally 10 on the Sick list every morning, I do not know what is the Cause of it, unless it is the Diet & poor Water. Billy Waters thinks he paid a good price for the Watch. I think it was worth all he paid for it, I know it was worth that to me, I hope You will get a chance to send me another, soon. I never have said much about My Superior Non Commissioned Officers, I do not think there is a company on the Ground that has poorer Non Commissioned Officers. There is our 4th Sergeant Warren1. he is no more fir for the place than Charlie Sherman, he is despised by all the Men & then there is, Dan Hutchins, I am sorry they ever accepted him. 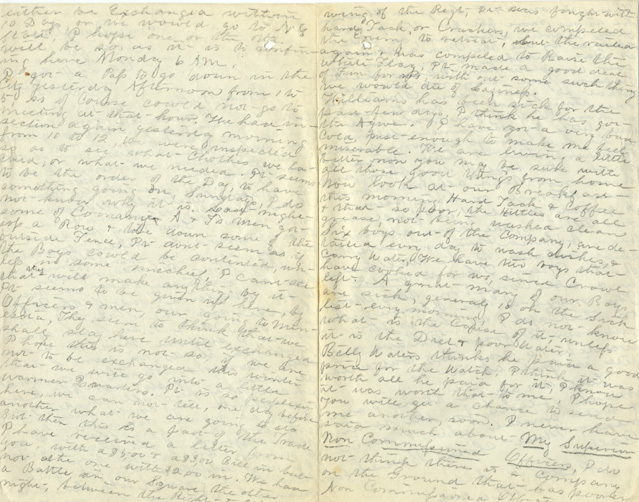 I can see the Reason you can not tell better what is going here, One writes one thing and one another, so it is hard to tell, You could tell but little by Williams’es letters, as he has always drawn so much. I know that I have tried to make the best of every thing, and have not told all we have been through or have seen. A great deal of it falls on our Officers, they have always been behind time in everything that related to the welfare of the Men, This is truth and all Confirm this story. The most of the Blame falls on the Capt, as he is the Superior Officer. I have not wanted to say this, but will tell it just as it is. * What is Ague? A 19th Century term for the recurring fever and chills caused by malaria. 1? 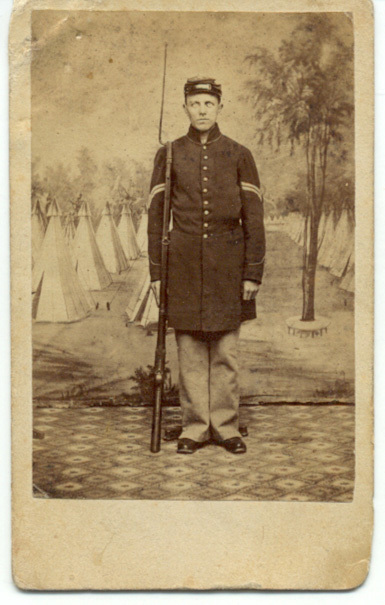 Warren, George H.–age,27 Enlisted 6 Aug 1862 at Lyons to serve three years; mustered in as sergeant, Co. D, 20 Aug 1862; killed in action, 5 May 1864, at The Wilderness, VA.